For other uses, see Fermi (disambiguation). Fermi liquid theory (also known as Landau–Fermi liquid theory) is a theoretical model of interacting fermions that describes the normal state of most metals at sufficiently low temperatures. The interaction between the particles of the many-body system does not need to be small. The phenomenological theory of Fermi liquids was introduced by the Soviet physicist Lev Davidovich Landau in 1956, and later developed by Alexei Abrikosov and Isaak Khalatnikov using diagrammatic perturbation theory. The theory explains why some of the properties of an interacting fermion system are very similar to those of the Fermi gas (i.e. non-interacting fermions), and why other properties differ. Important examples of where Fermi liquid theory has been successfully applied are most notably electrons in most metals and Liquid He-3. Liquid He-3 is a Fermi liquid at low temperatures (but not low enough to be in its superfluid phase.) He-3 is an isotope of helium, with 2 protons, 1 neutron and 2 electrons per atom. Because there is an odd number of fermions inside the atom, the atom itself is also a fermion. The electrons in a normal (non-superconducting) metal also form a Fermi liquid, as do the nucleons (protons and neutrons) in an atomic nucleus. Strontium ruthenate displays some key properties of Fermi liquids, despite being a strongly correlated material, and is compared with high temperature superconductors like cuprates. The key ideas behind Landau's theory are the notion of adiabaticity and the exclusion principle. Consider a non-interacting fermion system (a Fermi gas), and suppose we "turn on" the interaction slowly. Landau argued that in this situation, the ground state of the Fermi gas would adiabatically transform into the ground state of the interacting system. By Pauli's exclusion principle, the ground state of a Fermi gas consists of fermions occupying all momentum states corresponding to momentum with all higher momentum states unoccupied. As interaction is turned on, the spin, charge and momentum of the fermions corresponding to the occupied states remain unchanged, while their dynamical properties, such as their mass, magnetic moment etc. are renormalized to new values. Thus, there is a one-to-one correspondence between the elementary excitations of a Fermi gas system and a Fermi liquid system. In the context of Fermi liquids, these excitations are called "quasi-particles". Landau quasiparticles are long-lived excitations with a lifetime that satisfies where is the quasiparticle energy (measured from the Fermi energy.) At finite temperature, is on the order of the thermal energy , and the condition for Landau quasiparticles can be reformulated as . where is the chemical potential and is the energy corresponding to the given momentum state. where is the Fermi velocity. Physically, we can say that a propagating fermion interacts with its surrounding in such a way that the net effect of the interactions is to make the fermion behave as a "dressed" fermion, altering its effective mass and other dynamical properties. These "dressed" fermions are what we think of as "quasiparticles". Another important property of Fermi liquids is related to the scattering cross section for electrons. Suppose we have an electron with energy above the Fermi surface, and suppose it scatters with a particle in the Fermi sea with energy . By Pauli's exclusion principle, both the particles after scattering have to lie above the Fermi surface, with energies Now, suppose the initial electron has energy very close to the Fermi surface Then, we have that also have to be very close to the Fermi surface. This reduces the phase space volume of the possible states after scattering, and hence, by Fermi's golden rule, the scattering cross section goes to zero. Thus we can say that the lifetime of particles at the Fermi surface goes to infinity. The Fermi liquid is qualitatively analogous to the non-interacting Fermi gas, in the following sense: The system's dynamics and thermodynamics at low excitation energies and temperatures may be described by substituting the non-interacting fermions with interacting quasiparticles, each of which carries the same spin, charge and momentum as the original particles. Physically these may be thought of as being particles whose motion is disturbed by the surrounding particles and which themselves perturb the particles in their vicinity. Each many-particle excited state of the interacting system may be described by listing all occupied momentum states, just as in the non-interacting system. As a consequence, quantities such as the heat capacity of the Fermi liquid behave qualitatively in the same way as in the Fermi gas (e.g. the heat capacity rises linearly with temperature). The energy of a many-particle state is not simply a sum of the single-particle energies of all occupied states. Instead, the change in energy for a given change in occupation of states contains terms both linear and quadratic in (for the Fermi gas, it would only be linear, , where denotes the single-particle energies). The linear contribution corresponds to renormalized single-particle energies, which involve, e.g., a change in the effective mass of particles. The quadratic terms correspond to a sort of "mean-field" interaction between quasiparticles, which is parameterized by so-called Landau Fermi liquid parameters and determines the behaviour of density oscillations (and spin-density oscillations) in the Fermi liquid. Still, these mean-field interactions do not lead to a scattering of quasi-particles with a transfer of particles between different momentum states. The renormalization of the mass of a fluid of interacting fermions can be calculated from first principles using many-body computational techniques. For the two-dimensional homogeneous electron gas, calculations and quantum Monte Carlo methods have been used to calculate renormalized quasiparticle effective masses. Specific heat, compressibility, spin-susceptibility and other quantities show the same qualitative behaviour (e.g. dependence on temperature) as in the Fermi gas, but the magnitude is (sometimes strongly) changed. In addition to the mean-field interactions, some weak interactions between quasiparticles remain, which lead to scattering of quasiparticles off each other. Therefore, quasiparticles acquire a finite lifetime. However, at low enough energies above the Fermi surface, this lifetime becomes very long, such that the product of excitation energy (expressed in frequency) and lifetime is much larger than one. In this sense, the quasiparticle energy is still well-defined (in the opposite limit, Heisenberg's uncertainty relation would prevent an accurate definition of the energy). The structure of the "bare" particle's (as opposed to quasiparticle) Green's function is similar to that in the Fermi gas (where, for a given momentum, the Green's function in frequency space is a delta peak at the respective single-particle energy). The delta peak in the density-of-states is broadened (with a width given by the quasiparticle lifetime). In addition (and in contrast to the quasiparticle Green's function), its weight (integral over frequency) is suppressed by a quasiparticle weight factor . The remainder of the total weight is in a broad "incoherent background", corresponding to the strong effects of interactions on the fermions at short time-scales. The distribution of particles (as opposed to quasiparticles) over momentum states at zero temperature still shows a discontinuous jump at the Fermi surface (as in the Fermi gas), but it does not drop from 1 to 0: the step is only of size . In a metal the resistivity at low temperatures is dominated by electron-electron scattering in combination with umklapp scattering. For a Fermi liquid, the resistivity from this mechanism varies as , which is often taken as an experimental check for Fermi liquid behaviour (in addition to the linear temperature-dependence of the specific heat), although it only arises in combination with the lattice. In certain cases, umklapp scattering is not required. For example, the resistivity of compensated semimetals scales as because of mutual scattering of electron and hole. This is known as the Baber mechanism. Fermi liquid theory predicts that the scattering rate, which governs the optical response of metals, not only depends quadratically on temperature (thus causing the dependence of the dc resistance), but it also depends quadratically on frequency. This is in contrast to the Drude prediction for non-interacting metallic electrons, where the scattering rate is a constant as a function of frequency. The experimental observation of exotic phases in strongly correlated systems has triggered an enormous effort from the theoretical community to try to understand their microscopic origin. One possible route to detect instabilities of a Fermi liquid is precisely the analysis done by Pomeranchuk. Due to that, the Pomeranchuk instability has been studied by several authors  with different techniques in the last few years and in particular, the instability of the Fermi liquid towards the nematic phase was investigated for several models. The term non-Fermi liquid, also known as "strange metal", is used to describe a system which displays breakdown of Fermi-liquid behaviour. The simplest example of such a system is the system of interacting fermions in one-dimension, called Luttinger liquid. Although Luttinger liquids are physically similar to Fermi liquids, the restriction to one dimension gives rise to several qualitative differences such as the absence of a quasiparticle peak in the momentum dependent spectral function, spin-charge separation, and the presence of spin density waves. One cannot ignore the existence of interactions in one-dimension and has to describe the problem with a non-Fermi theory, where Luttinger liquid is one of them. At small finite spin-temperatures in one-dimension the ground-state of the system is described by spin-incoherent Luttinger liquid (SILL). 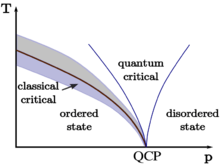 On the other hand, specific quantum critical point represented by fermion condensation quantum phase transition (see e.g. strongly correlated quantum spin liquid) supports quasiparticles with the finite quasiparticle residue . This phase transition does preserve the Pomeranchuk stability conditions, and proffers a new way to violate the stability of Fermi liquid. These unique properties of the phase transition allow one to explain both the scaling and the non-Fermi liquid behaviour observed in heavy fermion compounds. Understanding the behaviour of non-Fermi liquids is an important problem in condensed matter physics. Approaches towards explaining these phenomena include the treatment of marginal Fermi liquids; attempts to understand critical points and derive scaling relations; and descriptions using emergent gauge theories with techniques of holographic gauge/gravity duality. 1 2 3 Phillips, Philip (2008). Advanced Solid State Physics. Perseus Books. p. 224. ISBN 978-81-89938-16-1. 1 2 Cross, Michael. "Fermi Liquid Theory: Principles" (PDF). California Institute of Technology. Retrieved 2 February 2015. 1 2 Schulz, H. J. (March 1995). "Fermi liquids and non–Fermi liquids". arXiv:cond-mat/9503150 . ↑ Wysokiński, Carol; et al. (2003). "Spin triplet superconductivity in Sr2RuO4" (PDF). Physica Status Solidi. 236 (2). arXiv:cond-mat/0211199 . Bibcode:2003PSSBR.236..325W. doi:10.1002/pssb.200301672. Retrieved 8 April 2012. ↑ Lifshitz, E. M.; Pitaevskii, L.P. (1980). Statistical Physics (Part 2). Landau and Lifshitz. 9. Elsevier. ISBN 0-7506-2636-4. 1 2 Senthil, Todadri (2008). "Critical Fermi surfaces and non-Fermi liquid metals". Physical Review B. 78 (3): 035103. arXiv:0803.4009 . Bibcode:2008PhRvB..78c5103S. doi:10.1103/PhysRevB.78.035103. ↑ R. Asgari; B. Tanatar (2006). "Many-body effective mass and spin susceptibility in a quasi-two-dimensional electron liquid". Phys. Rev. B. 74: 075301. Bibcode:2006PhRvB..74g5301A. doi:10.1103/PhysRevB.74.075301. ↑ Y. Kwon; D. M. Ceperley; R. M. Martin (1994). "Quantum Monte Carlo calculation of the Fermi-liquid parameters in the two-dimensional electron gas". Phys. Rev. B. 50: 1684. Bibcode:1994PhRvB..50.1684K. doi:10.1103/PhysRevB.50.1684. ↑ M. Holzmann; B. Bernu; V. Olevano; R. M. Martin; D. M. Ceperley (2009). "Renormalization factor and effective mass of the two-dimensional electron gas". Phys. Rev. B. 79: 041308(R). arXiv:0810.2450 . Bibcode:2009PhRvB..79d1308H. doi:10.1103/PhysRevB.79.041308. ↑ N. D. Drummond; R. J. Needs (2013). "Diffusion quantum Monte Carlo calculation of the quasiparticle effective mass of the two-dimensional homogeneous electron gas". Phys. Rev. B. 87: 045131. arXiv:1208.6317 . Bibcode:2013PhRvB..87d5131D. doi:10.1103/PhysRevB.87.045131. ↑ Baber, W. G. (1937). "The Contribution to the Electrical Resistance of Metals from Collisions between Electrons". Proc. Royal Soc. London A. 158: 383–396. ↑ R. N. Gurzhi (1959). "MUTUAL ELECTRON CORRELATIONS IN METAL OPTICS". Sov. Phys. JETP. 8: 673–675. ↑ M. Scheffler; K. Schlegel; C. Clauss; D. Hafner; C. Fella; M. Dressel; M. Jourdan; J. Sichelschmidt; C. Krellner; C. Geibel; F. Steglich (2013). "Microwave spectroscopy on heavy-fermion systems: Probing the dynamics of charges and magnetic moments". Phys. Status Solidi B. 250: 439–449. arXiv:1303.5011 . Bibcode:2013PSSBR.250..439S. doi:10.1002/pssb.201200925. ↑ C. C. Homes; J. J. Tu; J. Li; G. D. Gu; A. Akrap (2013). "Optical conductivity of nodal metals". SciRep. 3: 3446. arXiv:1312.4466 . Bibcode:2013NatSR...3E3446H. doi:10.1038/srep03446. ↑ I. I. Pomeranchuk (1959). "ON THE STABILITY OF A FERMI LIQUID". Sov. Phys. JETP. 8: 361–362. ↑ Actually, this is a subject of investigation, see for example: http://arxiv.org/abs/0804.4422. ↑ Ong, edited by N. Phuan; Bhatt, Ravin N. (2001). More is different : fifty years of condensed matter physics. Princeton (N.J.): Princeton university press. p. 65. ISBN 0691088667. Retrieved 2 February 2015. ↑ M. Soltanieh-ha, A. E. Feiguin (2012). "Class of variational Ansätze for the spin-incoherent ground state of a Luttinger liquid coupled to a spin bath". PRB. 86 (20): 205120. arXiv:1211.0982 . Bibcode:2012PhRvB..86t5120S. doi:10.1103/PhysRevB.86.205120. ↑ Amusia, M.; Popov, K.; Shaginyan, V.; Stephanovich, V. (2014). "Theory of Heavy-Fermion Compounds - Theory of Strongly Correlated Fermi-Systems". Springer. ISBN 978-3-319-10825-4. ↑ Faulkner, Thomas; Polchinski, Joseph (2010). "Semi-Holographic Fermi Liquids". arXiv:1001.5049 .